Introducing the competitors in this year’s tournament. A pretty good match. Like the other young boys a few nights ago, Kawato was fired up and wanted to start the match. After TAKA and Taichi both ignored him for a while, Taichi eventually entered the ring and let Kawato throw some strikes. It wasn’t long before Kawato was in trouble, and from there the match developed with Liger helping out and urging Kawato on. This was pretty fun and a decent opener for the show. This was okay for the most part, but the final portion of the match had some serious problems. It started out fine with Juice Robinson then Ricochet taking turns against Los Ingobernables, but once Dragon Lee got in the ring things too a turn for the worse. He and SANADA had what appeared to be a string of miscues that looked very awkward, and the referee even stopped before a three count when it was clear that Lee made no attempt to kick out of the pin he was in. Pretty good match. It consisted of lots of big guys slamming into each other, but it was fun. The pace to this one seemed higher than some of the other recent War Machine matches which I like. The ending wasn’t at all unexpected, but overall I enjoyed this match. Good match. The first half or so was dominated by the pairings of Scurll versus Gedo and Omega versus Okada with sporadic help from teammates. Then the match started to break down and everyone got involved. This was fun and had a ton of energy, especially towards the end. It was similar to the 6-Man match from the 29th with the same teams (except with Fale instead of Takahashi), but it was different enough to make this one interesting as well. This was a good and interesting match. All four men are part of the Suzuki Gun faction, and all of them are known for cheating as much as they possibly can. It briefly started looking like El Desperado and Kanemaru might fight fairly, but that didn’t last long. Taichi and TAKA helped the men they came out with, and a lot of the fighting took place outside the ring. Weapons were used and alliances seemed fragile, making this one of the most interesting matches of the tournament for both El Desperado and Kanemaru. Good match. It started with a little lighthearted comedy with ACH and Taguchi flexing their butts, but it soon transitioned into a fairly serious match. Taguchi worked on ACH’s leg for a while which was the biggest factor in how the match developed. As the match went along, it seemed like Taguchi was getting further and further into the lead despite a few bursts of offense from ACH. I like the ending to this one. Like the previous match, the finish here shows just how close everyone is in B Block. Another good match. Tiger Mask started strong by hitting a tombstone piledriver almost immediately. It took a while for BUSHI to recover, and most of the match seemed to be BUSHI slowly building momentum and eventually overtaking Tiger Mask. This was another match that felt very even throughout, and the difference in this one came with some underhanded tactics. Good match. They started off with a series of chains that all ended in standoffs. 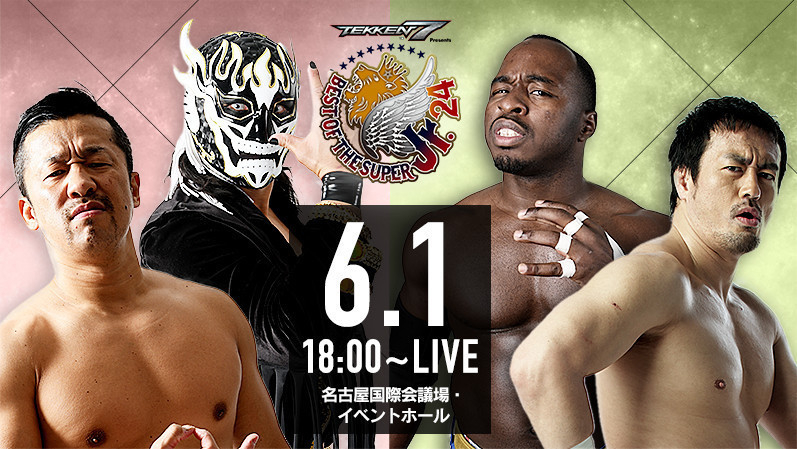 The match slowed down a bit from there with a few near countouts, but the pace picked up towards the end with some fast action from Volador Jr. and multiple submission attempts from KUSHIDA. The buildup to the finish was good, but I think the final pinfall was questionable because it seemed like both men had their shoulders down alternatively, but the referee just counted to three regardless. Will Ospreay heads to the ring after Volador Jr. leaves. Ospreay says he’s happy that KUSHIDA will represent B Block in the finals. He talks about how he debuted in New Japan against KUSHIDA, but he hasn’t beaten him yet. KUSHIDA has a lot to prove after losing the Jr. Heavyweight Title, but Ospreay needs to prove that he can beat KUSHIDA. I think the finale for A Block was better, but this was still a good show. I liked how the matches tonight were all very close. I wasn’t exactly sure how the tournament would be decided since B Block was prectically guaranteed to be a four-way tie, but KUSHIDA beat all of the men who won before him, so that’s why he advances. It’s an interesting way to end the tournament, and that wasn’t on my mind like A Block’s obvious point situation was. That made this night a little more surprising as far as the winners go. The main event was good, but it had a long lull in the middle of it. I really liked ACH and Taguchi in the ring together. It was fun but serious at the same time. I was also pulling for ACH the most tonight, so that probably had a lot to do with my enjoyment of this match as well.